An exclusive 5 On Your Side investigation found Cleveland hospitals share in thousands of violent attacks inside hospitals nationwide every year. According to estimates obtained from the U.S. Bureau of Labor Statistics , there were 5,710 cases of hospital violence in private hospitals in 2013—the most recent year available. In addition, a July 2014 survey of hospitals nationwide by the the International Association of Healthcare and Security Foundation found a 25 percent increase in crime between 2012 and 2013. "The number one thing we found: violent crime," said IAHSS President Steve Nibbelink. Hospitals in Cleveland and across Ohio are not unsafe, but they are fighting the identical crime trend threatening hospitals nationwide. A recent attack just last August left one patient wounded after he allegedly attempted to grab an officer's Taser and handgun inside the emergency room. 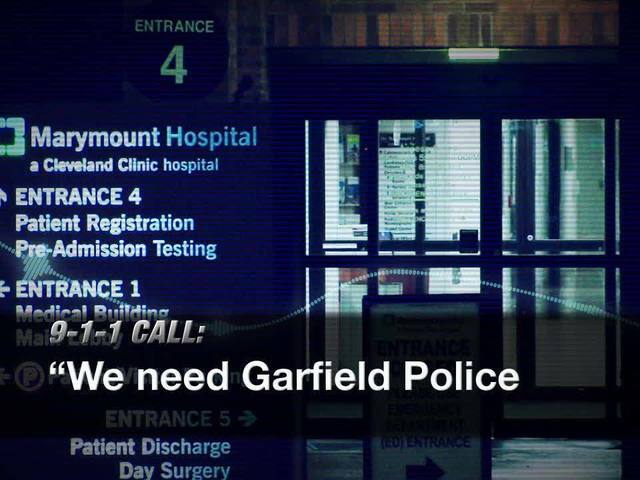 A 911 call from Marymount Hospital in Garfield Heights recorded both the gunshot and anxiety inside the ER. And it's not the first time Ohio hospitals have come under fire—gunshots have killed four people and wounded a fifth since 2010. And in many cases, it's nurses who become victims. Sue is a nurse who was violently attacked by a patient on the psychiatric wing at St. Vincent Charity Hospital in Cleveland. She asked newsnet5.com not to use her last name. "He walked into his room, turned around and slugged me in the face," says Sue, who was repeatedly kicked in the head with steel toe boots worn by the patient. Sue said while the hospital is now a leader in safety, she insists "not much has changed in the 10 years since" at many hospitals. "I heard from other people, even from hospital management—you work in a psychiatric facility, what do you expect?" says Sue, who remains convinced hospital violence is underreported. A leading Ohio nurses union agrees. The Ohio Nurses Association says nurses are often fearful of reporting violence. "Insubordination, or the facility saying they're being insubordinate because they are not taking care of the patient at that time when the violent act takes place against them, "says ONA executive Tiffany Bukoffsky. "It's a fear of being disciplined," she says. Across Ohio we found an estimated 520 cases of violent injuries over a two-year period—340 nurses victims of assault. A spokesperson for the Clinic said the figures were for its Main Campus and that crime had decreased between 2014-2105. University Hospitals reported only figures for the last 14 months, blaming record-keeping changes involving how violent crime was classified for the lack of detail. As a result, University Hospitals reported only two assaults and nine disorderly conduct cases. Meanwhile, a national hospital security consultant believes not enough is being done to protect patients and staff through active shooter drills and education. Ty Moeder is President of Mitigation Dynamics and says not enough hospitals are being proactive. "A generous number would be less than a third across the country," said Moeder, referring to the number of hospitals actively engaged in educational programs or training videos. "Preventing an armed violent intruder is highly unlikely," says Moeder, "however through proper policy, training and drills we can dramatically reduce the overall effects of such an incident." A spokesperson for the Ohio Hospital Association said its working closely with hospitals across the state to protect staff and patients.